Window Shutters Chipping Sodbury from Just Shutters. Combining the finest quality and the widest range of shutter choices, with great value and local specialist service. Call your local husband and wife shutter experts; Rob (pictured right) and Linda Reeves on 0117 370 1594. Just Shutters have earned an unrivalled reputation for quality and service over many years. This reputation was built through our love of shutters and dedication to customer service. We couple this with our lifetime guarantee for ultimate peace of mind. 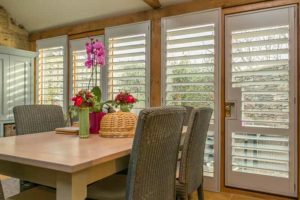 Rob and Linda Reeves, your local Chipping Sodbury plantation shutter experts, are here for you every step of your journey, from design, through creation and installation. Just Shutters offers the broadest range of interior shutter styles and finishes in the UK (including some exclusive ranges). Meaning, whatever your style, whether bright, clean and modern, bold and colourful, or warm and traditional, we can create the perfect solution for you and your home. Shutters can be as unique as you are. 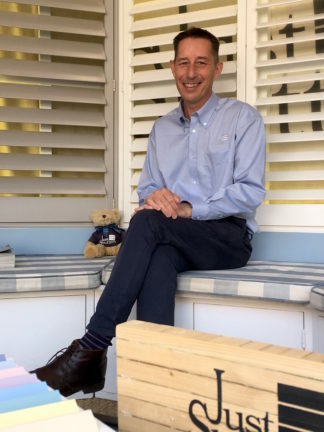 This is why Rob and Linda will work with you, will listen and advise so that we can design shutters you will fall in love with over and over again. Coupling designer looks with great value that adds £ to your home! Just Shutters offer ranges to suit your budget, from our entry level CraftWood range, through to our luxury hardwood ranges which can be tailored to the greatest of shapes and colour schemes. Furthermore, there are many additional value added benefits to shutters. For example; improved energy efficiency, heat loss is diminished, and no laundering or professional cleaning is ever needed. Long after you have replaced curtains or blinds, shutters will endure. Our lifetime guarantee means that you can have peace of mind for years to come. Shutters are our passion and our pride. Our customers are put first through every stage of their journey with us. Call us today on 0117 370 1594 and allow us to show you just how we earned our unrivalled reputation. A random selection of reviews taken from independent review site checkatrade where we have over 1600 reviews, and a score of 9.9/10. Plantation shutters listed on windows on felt different rooms. Fitting of shutter to two bedroom windows. Plantation shutters 2 bay windows and 4 other windows. You may also like to see shutters Bristol and Just Shutters Clifton.